Includes power-folding heated mirrors, turn signals, puddle lamps and driver's side self-dimming feature. 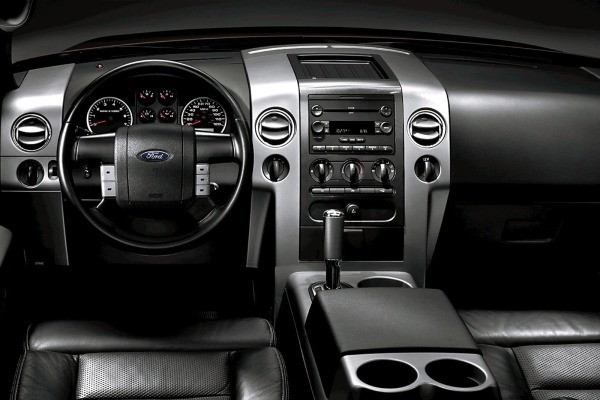 Includes rear ventilation ducts at the rear of the center console. Includes P255/70R18H BSW all-season spare tire. 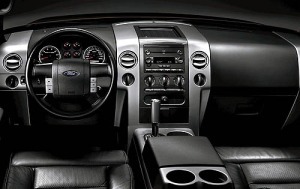 Includes MP3 player capability, auxiliary audio input jack and adjustable speed compensated volume. Includes pickup box front header bar. Includes an overhead mini-console that does not include storage. Includes body color H-bar grille, body color door handles, unique clear headlamps with Medium Platinum bezel, power and heated driver/passenger seats, front passenger seat manual lumbar, memory driver seat and power adjustable pedals, electronic automatic temperature control, black leather steering wheel with audio and climate controls, self-dimming rear view mirror and power, heated side mirrors with external mounted turn signal indicator and driver side self-dimming feature and body color mirror skull caps. Includes (2) pick up box load bars. Includes DVD player, high performance 8" flip down overhead LCD screen, two battery equipped wireless headphones, rear seat audio controls, handheld remote control with batteries, heavy-duty 72-amp battery (when ordered with both Satellite Radio and Trailer Tow Package), audio/video jacks to connect video games and audio equipment and operating manual and quick start instruction card. Includes CD/DVD case, first aid kit and two large storage bins. Includes reverse camera mounted in the tailgate handle bezel and video display contained in the interior self-dimming rearview mirror. Required on units with GVWR of 14,000# or less for California, Connecticut, Maine, Massachusetts, New York, Pennsylvania, Rhode Island and Vermont registration. Optional for Arizona, Delaware, Maryland, Nevada, New Hampshire, New Jersey, Oregon and West Virginia (Cross-Border states). Available on 5.4L FFV engine (99V) to Commercial and Government Fleet only on the following vehicle configurations: Regular Cab 8' box 145" WB 4x4 with 27 gallon fuel tank, Supercab 6.5' box 145" WB 4x4 with 27 gallon fuel tank, and SuperCrew 6.5' box 150" WB 4x4 with 27 gallon fuel tank. (NOTE: EPA's Cross-Border Policy specifies that Virginia does not qualify as a cross-border state to Pennsylvania as it is a contiguous state). 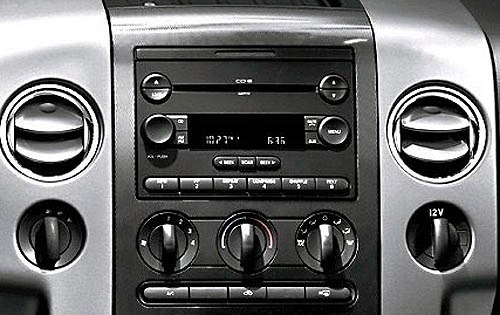 Includes AM/FM stereo with, MP3 player capability, subwoofer and adjustable speed compensated volume control. Includes (4) tie-down cleats and sliding pick up box bed divider. 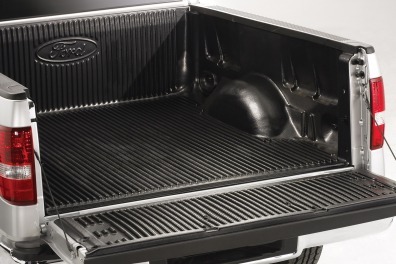 (Includes 2 tie-down cleats when ordered in combination with the Pickup Box Load Bars (68L)). Includes (2) pick up box storage bins. Includes 20" 6-spoke machined aluminum wheels, P275/55R20 OWL all-terrain tires, P255/70R18H BSW all-season spare tire and sport-tuned shock absorbers. Included with Heavy Duty Payload Package (427). Available on 5.4L gas engine (995) to Commercial and Government Fleet only. Available on 5.4L gas engine (995) with STX Special Edition Package (86E) to retail customers. Available on 5.4L FFV engine (99V) to Commercial and Government Fleet only on the following vehicle configurations: Regular Cab 8' box 145" WB 4x4 with 27 gallon fuel tank, Supercab 6.5' box 145" WB 4x4 with 27 gallon fuel tank, and SuperCrew 6.5' box 150" WB 4x4 with 27 gallon fuel tank. Includes Audiophile AM/FM stereo with in-dash 6-disc changer, subwoofer, adjustable speed compensated volume, auxiliary audio input jack and MP3 capability. Includes AM/FM stereo with 6-disc in-dash CD changer, MP3 player capability, subwoofer and adjustable speed compensated volume control. Includes Class IV trailer hitch receiver, 7-pin wiring harness, upgraded radiator and upgraded auxiliary transmission oil cooler. Includes power heated side mirrors with external turn signal indicator, self-dimming driver side exterior mirror and self-dimming rearview mirror. Includes power, heated glass, turn signals and puddle lamps.